The central image depicts Prince Regent Luitpold (b. 1821), de facto ruler of Bavaria from 1886 until his death in 1912. 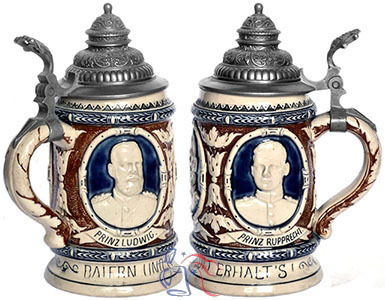 Shown on one side (below right) is his son Ludwig (1845-1921), who succeeded Luitpold as Prince Regent and reigned as King Ludwig III of Bavaria from 1913-1918. The third image (below left) is Ludwig’s son, Crown Prince Rupprecht (1869-1955). The “Palatinate” reference in the text speaks to a region that was once part of Bavaria, but is now within the German State of Rhineland-Palatinate, established in 1946.